This article demonstrates how to create automated tests for Azure Functions. Testing all code is recommended, however you may get the best results by wrapping up a Function's logic and creating tests outside the Function. Abstracting logic away limits a Function's lines of code and allows the Function to be solely responsible for calling other classes or modules. This article, however, demonstrates how to create automated tests against an HTTP and timer-triggered function. The sample repository is available on GitHub. The following example describes how to create a C# Function app in Visual Studio and run and tests with xUnit. Create an HTTP function from the template and name it HttpTrigger. Create a timer function from the template and name it TimerTrigger. 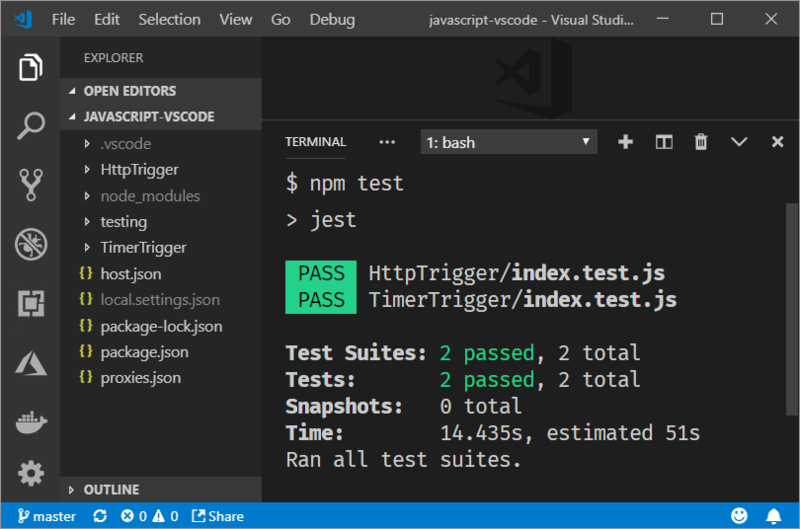 Create an xUnit Test app in Visual Studio by clicking File > New > Project > Visual C# > .NET Core > xUnit Test Project and name it Functions.Test. Reference the Functions app from Functions.Test app. Now that the applications are created, you can create the classes used to run the automated tests. Each function takes an instance of ILogger to handle message logging. Some tests either don't log messages or have no concern for how logging is implemented. Other tests need to evaluate messages logged to determine whether a test is passing. The ListLogger class is meant to implement the ILogger interface and hold in internal list of messages for evaluation during a test. BeginScope: Scopes add context to your logging. In this case, the test just points to the static instance on the NullScope class to allow the test to function. IsEnabled: A default value of false is provided. Log: This method uses the provided formatter function to format the message and then adds the resulting text to the Logs collection. The Logs collection is an instance of List<string> and is initialized in the constructor. This enumeration specifies the type of logger used by the tests. Data: This property returns an IEnumerable collection of sample data. The key value pairs represent values that are passed into a query string. CreateDictionary: This method accepts a key/value pair as arguments and returns a new Dictionary used to create QueryCollection to represent query string values. CreateHttpRequest: This method creates an HTTP request initialized with the given query string parameters. CreateLogger: Based on the logger type, this method returns a logger class used for testing. The ListLogger keeps track of logged messages available for evaluation in tests. Http_trigger_should_return_known_string: This test creates a request with the query string values of name=Bill to an HTTP function and checks that the expected response is returned. Http_trigger_should_return_string_from_member_data: This test uses xUnit attributes to provide sample data to the HTTP function. Timer_should_log_message: This test creates an instance of ListLogger and passes it to a timer functions. Once the function is run, then the log is checked to ensure the expected message is present. If you want to access application settings in your tests, you can use System.Environment.GetEnvironmentVariable. 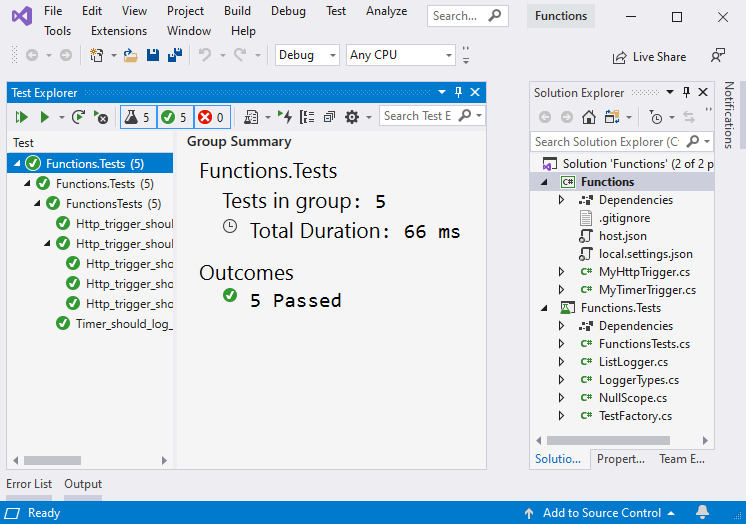 To run the tests, navigate to the Test Explorer and click Run all. To debug the tests, set a breakpoint on a test, navigate to the Test Explorer and click Run > Debug Last Run. To set up your environment, initialize a new Node.js app in an empty folder by running npm init. With the project initialized, you can create the modules used to run the automated tests. Begin by creating a new folder named testing to hold the support modules. This module mocks the log function to represent the default execution context. This module implements the IsPastDue property to stand is as a fake timer instance. The HTTP function from the template returns a string of "Hello" concatenated with the name provided in the query string. This test creates a fake instance of a request and passes it to the HTTP function. The test checks that the log method is called once and the returned text equals "Hello Bill". The timer function from the template logs a message at the end of the body of the function. This test ensures the log function is called once. Next, set a breakpoint in your test and press F5.